Several years ago I was foaling out several mares at my veterinary clinic. As a veterinarian with extensive experience foaling out mares, I felt I was as prepared as possible at my clinic. For years the process went smoothly. We had some dystocias (difficult births) but I was able to resolve them largely without incident. Until the night one of my favorite mares, "Quick Print" started to foal. I had foaled her out many years in a row so I was calm as I walked over to the foaling barn. That feeling would quickly change. Her foal was upside down, the head and both limbs were back. As hard as I tried I could not get the head and the limbs in a position to deliver the foal. Even under general anesthesia I was unable to deliver the foal vaginally. I worked hour after painful hour trying in vain to correct the malposition. My muscles ached and I could barely lift my arms. Finally I had to admit that with the limited equipment at my facility, I was defeated. I could not deliver this foal. During the process I begged the owner to let me drive the mare to a hospital but he refused. In the end, tears ran down my face as I pushed the euthanasia solution that would end her life. From that experience I was determined that we needed an equine hospital in the Fort Wayne area. I worked with Dr. Conley and eventually Conley and Koontz Equine Hospital was born. So what advantages does Conley and Koontz Equine Hospital offer for the mare in foal? First, and often over looked, is that we have indoor temperature controlled stalls. The stall walls are constructed with porous free painted cinder block, padded floors and a drain in each stall. The stalls are sanitized between patients. If you are foaling in a wooden stall with a dirt floor, you are foaling in the germs of the last horse in the stall. We monitor each mare with a foal alert system. We also use internet based foaling cameras so we can check on the mares anywhere there is internet access. We check the mare's milk in our in-house laboratory to determine pending parturition. We have licensed veterinary technicians on staff that monitor the mares. Finally and most importantly we have an actual veterinarian that lives at our hospital and is prepared to deliver the foal. If your mare has a dystocia, being at the hospital is probably your only chance to deliver a live foal. By the time an owner or manager discerns that there is a problem and places a call to the veterinarian, it is too late to save the foal. In 20 years of practicing veterinary medicine I have sadly never delivered a live foal from a dystocia case at the farm. Stage 3 labor in the mare has been described as violent and explosive. Unlike other mammals the mare does not suffer long labor periods. Once her water breaks she has powerful contractions that push the foal out in minutes not hours. If the foal does not come out almost immediately it will be killed under the constricting pressure of these powerful contractions. At Conley and Koontz Equine Hospital we have veterinarians there to help with the delivery just like in a human hospital. 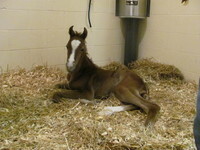 If the foal does not present correctly we can try to manually reposition the foal to help with delivery. If that does not work we simply walk the mare a few yards to our induction stall where the mare is placed under general anesthesia and the veterinarians perform an assisted delivery. 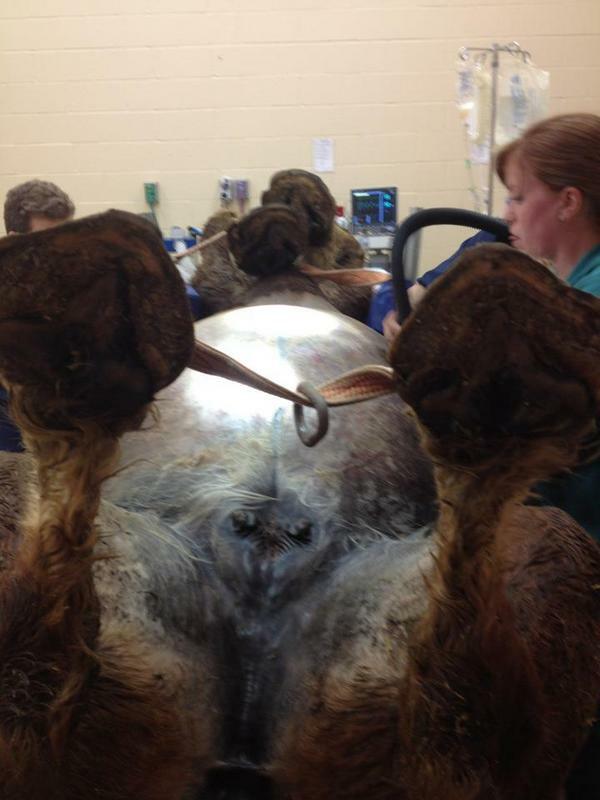 Under anesthesia the mare's hind quarters are lifted by our crane. This stops the intense contractions and gives us room inside the uterus to reposition the foal. Our assisted delivery under anesthesia almost always works to get the foal out. If assisted delivery does not work we simply lift the mare onto the surgery table and perform a cesarean section. Most importantly our cesarean section is performed by a board certified surgeon. Speedy intervention with all the options available gives us the best chance to deliver a live foal, a live mare, and a mare that has future reproductive potential. 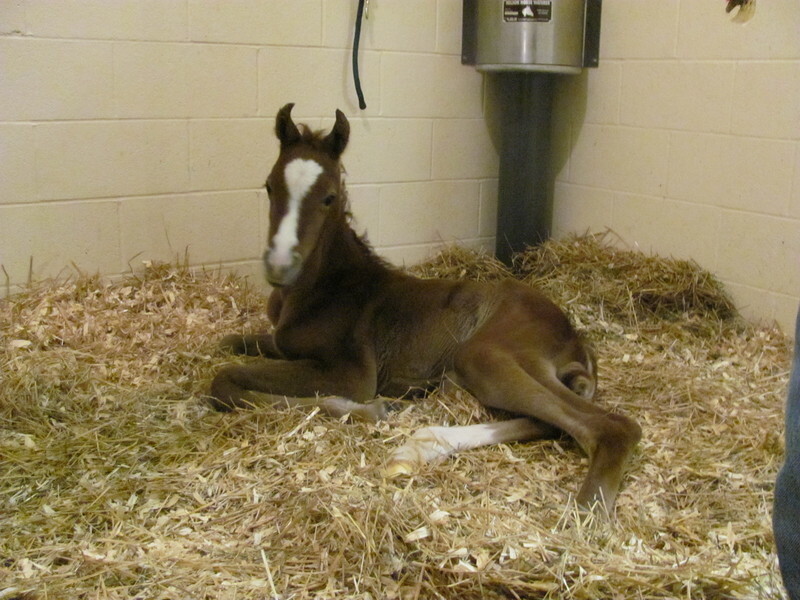 No matter where it is delivered, every new foal should be seen by a veterinarian. At Conley and Koontz Equine Hospital we have veterinarians monitor the new foal and it's mother to be sure they are developing properly in the first few days of life. If the foal does have medical problems, early intervention can be the difference between a dead foal or a healthy baby. -	Is the facility temperature controlled? -	Are the stalls sanitized between mares? -	How are the mares monitored before foaling? -	Will a veterinarian be present at the delivery? -	If the mare has a dystocia, do they have anesthesia capabilities? -	Does the facility have a surgery suite? -	Is a board certified surgeon doing the surgery? -	Is a veterinarian monitoring the foal in the first few days of life? -	What happens if the foal gets sick? Breeding and caring for a mare is expensive both monetarily and emotionally. You should be sure that you protect your investment by choosing the right place to foal. Please consider Conley and Koontz Equine Hospital when making this very important decision.